The Workshop will be held in central Italy at the Oasi di Greccio 15 minutes’ walk from the village of Greccio. 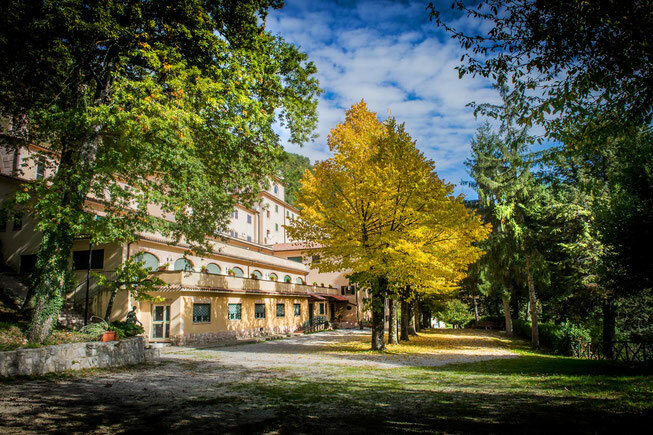 The conference centre is in a modernized but charactaristic older building at an altitude of 700m set in beautiful woodland on the mountainside. The centre has been pre-booked to ensure the greatest economy and maximum participation. The purpose of the workshop is to bring together an international experts to present their results and encourage discussion. The emphasis is on experimental innovation, methods, instrumentation, diagnostics and theory. In addition there will be afternoon discussions on topics of interest including explanations for the anomalies. The full workshop fee is EUR 500 per person (both participants and accompanying persons) for early paying registration. This fee will increase by EUR 100 in June 2018. The inclusive fee covers lunch and dinner and coffee breaks shown in the outline program, accommodation and the excursion. Requests will be considered for financial assistance. Accommodation at the conference site may be available outside the designated nights at additional cost. Pay and register EUR 500 per participant. Pay and register EUR 300 per external participant. The program will consist of both invited and contributed talks. Oral papers are invited on experimental and theoretical results and will be reviewed by the Committee. It is essential that all presenters submit a 1 page Abstract in MS Word format (A4 paper size) (see Important Dates below). You are encouraged to support your presentation with a poster paper. A bronze medal will be awarded for the best poster paper. Authors should estimate 30 minutes for each presentation but variations on this time (e.g. 1 hour) can be made by arrangement. Power Point presentations are preferred. (Bring a USB memory key or DVD-R.). All presentations and papers should have numbered pages and the filename should start with the presenter's surname (Further instructions will follow). The organization will compress your submission into portable document format (.pdf) for publication on the ISCMNS web-site and DVD-R and will be freely available for download. Presentations will not be published on-line until August and may be modified or withdrawn by the authors at any time. Papers may also be submitted to the electronic journal Condensed Matter Nuclear Science and peer reviewed. By Plane: Rome Fiumicino airport is an intercontinental hub and about 120 minutes drive away. We may be able to suggest a shuttle service by bus taking you directly to the hotel if you inform us of your flight times. By Train: Book with http://www.trenitalia.com/ You can get a taxi from Terni railway station. The Hotel is about 20 minutes away. Again we may be able to coodinate a taxi taking you directly to the hotel if you inform us of your trai times. The taxi cost is about EUR 50 per journey, (up to 8 passengers). Presentation title to be submitted. Last day for applications forfinancial assistance. Last day for reduced registration fee. Please note- 'early bird' discounts (presently on offer) end this week. I hope to see you there, Gennady, I remember our meeting last time. hmm are you going to it? Lower attendance this year than at Asti in 2017, but running smoothly. Greccio is in the baby mountains on the edge of Lazio and Umbria and today it is just 30 meters below the cloud base. All the usual suspects in attendance, Mike McKubre, Peter Hagelstein, Luca Gamberale, Paolo Tripaldi Francesco Celani, George Egely, Davis Nagel, Dewey, and a couple of other LENR forum members. We get everywhere, but...no time to dally, must get back to the talks, that is what I came for. Yesterday began the 13th Workshop on Anomalies in Hydrogen Loaded Metals. Along with Alan, Wyttenbach, McKubre in attendance, we have other LF members there also. Basically the old guard. As you may notice, this thread began with the previous years conference, so I thought it would be good as an add on. That way, we can compare the two and see if anything new has popped up. really ? In a monastery ? For real ? Where exaxctly? And why? YW. The Wifi can not handle much traffic, so we may have to wait a few days to get a good report. I heard from Alan only once, and he felt lucky to get through. All are getting along well, and at the time McKubre was fitting he and Wyttenbach's presentation into the lineup. Probably done by now. Should be a good video when available. Living large in Oasi di Greccio, Italy. We just finished a splendid four-hour banquet meal together, in fact, to celebrate the last evening of the 13th International Workshop on Anomalies in Hydrogen-Loaded Metals. Edit: This post got moved out of the original context, which was a response to a query about what Alan was doing at a monastery. Now it sounds like a strange boast, but whatev. I've been making this mistake of assuming context continuity in my online postings since before the web was born. It serves me right, for not quoting the message to which I'm responding. Someday I'll learn. There will not be any video available, as nobody recorded any, but I captured the audio at least. Ruby will be publishing it again at ColdFusionNow.org, sometime in the next few weeks. What one thing impressed you the most? Good to hear eating well, and enjoying yourselves. I do not think many appreciate just how much time, and money those like yourself dedicate to pursuing the science. You deserve to have a little fun in return for your efforts. There was a presentation by a brilliant materials scientist, John Wallace, which described the dynamic processes of void creation and destruction in metal lattices. This could help illuminate a number of aspects of cold fusion processes, such as the 'breathing' non-equilibrium conditions that are strongly linked to excess heat onset by researchers such as McKubre. Thank you Bobeson. I hear Fukai and his Superabundant Vacancies made an impression also. Same goes for Dubinko. The workshop went very well, everybody very cordial. My talk went down ok- at least a few people said nice things about it, and it gave me an opportunity to get into some deep and serious discussion with people like Dave Nagel, Mike McKubre, Jacques Ruer, Francesco Celani and others too. Some of it I suspect we were actually helping each other. Here a couple of interesting shots btw. Jean-Paul Biberian brought along one of Martin Fleischman's original vacuum insulated calorimeters. Here's some photos. And here (lying on the table) is the twin-wall outer container with its half-silvered upper section. To a cold fusion experimenter these are 'holy relics and the chance to handle them pretty powerful medicine. Above is the presentation I made at the workshop- I think the Q&A may have been recorded.